When somebody asks me a question about having kids, be it when we are having more, or how many we are planning on having, I'm going to answer them. Honestly. Here's the thing. In the past when people have said something like, "Your little girl is so cute. Don't you want to have another soon?" I've always said something like, "ahahaa...oh, eventually," or any other non-committal answer I can manage to squeeze out before sneaking into a bathroom to cry. After such an encounter my mind would fill with thoughts like, "I can't believe she asked me that! Since when is that his business? How could she be so oblivious! Doesn't he know I'm infertile?" Well. No. They don't. I mean, I don't exactly go around wearing a sign. Which is why I've decided to answer questions honestly. And whether or not people have the right to ask about my reproductive plans is beside the point. And truthfully, the fact that they're asking is most likely because they care about me and my family and not as a function of their well crafted passive-aggressive ploy to break my heart. "So, when are going to give Z-cakes a sister or brother?" "Well, I'm infertile. We've been trying to have another baby for about 2 & 1/2 years now and we're just not sure when she'll have a sibling." "Isn't it time for another baby?" "Yes! I'm struggling with infertility so I'm not sure when another baby will be on the way." "Do you want to have your kids far apart in age?" "No. But I'm dealing with infertility so we don't really have the option of choosing how far apart to space our children." "How many kids do you plan on having?" "Well, I have infertility issues so we'd like to have more than one but we try not to set our hopes on a specific number." "Have you tried yoga and B734 (I made that up) vitamins?" "Have you thought about adoption." "Right now we're going through medical infertility treatments. The thought of adoption is one thing too many for us right now. But thank you for the suggestion." I also reserve the right to still return home to N8tr0n and bawl my eyes out after bravely answering such questions. I think that reaction is allowed. I hope that none of this sounds too harsh. My point is, we all have struggles that we are dealing with. Sometimes during conversations people ask questions that they don't realize (and have no way of actually knowing) are hurtful and we can choose to be offended or we can remember that most people are well-meaning. And for the times when we are truly hurt by the comments/questions of others, we (hopefully) have a support system of people who know what we're going through, who don't care if we're crying again. I have that in N8tr0n and the rest of my family. I have that in you. So go ahead. Ask me. I'm ready. oh, miranda. you are brave and sweet. i like your answers and definitely think more people should speak up about their infertility issues, even though it's so tough. so many women are dealing with it, i think commonalities will crop up! just last night i read this and this. it's nice to know we're not alone. I think this is just perfect. The fact is, people should not be asking those questions! Even if it is not part of a ploy to break your heart. I absolutely think you should say just these things. It's honest, it's polite, and it has the added bonus of perhaps teaching people to keep their busybody questions to themselves! Actually, I think responses like these will bring people from a position of judgment to one of compassion, and that is a good thing. I'm so sorry you are experiencing this struggle. I really don't think most people mean to be cruel; their comments are just an avenue of starting a conversation to connect with you in some way. Even though they don't mean to hurt you, and you feel like saying all of those things, you really don't want to embarrass/humiliate them for their good intentions. I think a good reply might be, "I know you don't know this, but your question is a hurtful one. But I appreciate your interest." Then just change the subject, or ask a question about them. I believe family planning questions should be off limits! I am so sorry people have been so brash in their questioning. I'm also sorry that you and others have to deal with this. It always seems to happen to the best of mothers. I think your answers are perfect! I think I may just use one of those answers next time I get a similar question...my little girl is 16 months old, so "don't you know it is time to have another one?" I feel your pain...I don't think the longing will ever go away. I told myself when I got pregnant that I would never "go there" again with infertility...but as time goes by, it is impossible to stay away from those feelings. Best of luck, you are in my prayers! First off I have to say I am deeply proud of you...even though I never went through this my SIL did after the loss of our beloved nephew it took 5 years to be blessed with my beautiful neice...my heart goes out to you...I think being upfront and honest allows others to know your difficulties so that we can pray for you during this time. I will be keeping you in my thoughts and prayers Z cakes is such a lucky girl to have such a strong mother as an example...Blessings to you. Oh Miranda, I am so sorry you have to go through this! I love your answers, as well as Marta's. It's so sad that people can be so insensitive when it comes to pregnancy related topics. Those months after I lost Michael were the hardest... I had people asking me (just days after his burial) when I was going to get pregnant again. I had several strangers ask when my baby was due, when all it was was post pregnancy belly. I too would just go home and cry my little eyes out. I'm praying for you and your sweet family! I completely agree that people don't mean to be cruel. In fact, if you read the post again, I hope you will see that that is the message I am trying to convey. These answers are a way for me to actually make a connection with people by sharing my struggle rather than being dismissive. They are not meant to be embarrassing or to call anyone out. My answers are meant to open a dialog with them if they're interested. Of course the tone of voice used when answering is important too. All of these answers could be said sarcastically, in which case I agree that they could be embarrassing. I think your answers are brave and perfect. I'm sorry to say I've probably been one of those naive "innocent" question-askers in the past. I think infertility is not the only arena where we ask questions that can bring up pain for another person. But, as soon as I know their story, be it one of infertility or other struggles, I'm the #1 supporter. It's scary to open the dialogue, but I think people will react with softer hearts and greater sensitivity than they could without knowing. At least that is my hope for you! I'm sorry to hear that you are going through this, and you have the right to deal with it (and people) in your own way. I've known a few people who have also had fertility issues and so I avoid asking anyone questions about when they are going to have a baby or have their next child. You just never know what kind of a situation they might be in. Oh, Miranda. You are one of the bravest and strongest women I know. Really. I admire your openness and frankness and kindness. You're one of my favorites. I really admire you for this. What a brave and honest way to answer these questions. And yeah, those people are almost always well meaning, but when in the throes of infertility even the slightest reminder of your current situation can really sting. That is all... I'm sorry, and I know (a little bit) how you feel. Hang in there lady. I like your answers. Here's my latest one when asked when I'll be having another baby: when Jesus comes again and places that baby in my arms. It's a good one I think. And for all I know it's totally true. I love you dude. I'd like to give you a hug. You go girl! I love your answers. My daughter is also dealing with infertility. She has a 5 year old daughter that is adopted, and would love to adopt again. In the meantime she would love to conceive--and has and is trying many medical procedures. Last week she had a 'friend', who she hadn't talked to for over a year call and tell her that if she took Geritol she would get pregnant. She also had a couple come to her home and offer to be a 'surrogate' mother. This all happened on Mothers Day. She knows people are well meaning, but it is just hard. I have a shoulder that you may cry on at anytime! Love this. Love the honesty. Because really, it is the best thing in delicate situations. After months of my grandmother pestering me about being 30 and single, last week I finally told her that after how badly I was hurt the last time, it'll be awhile before I get into another relationship. She had no idea, and know understands. And that's all people really need to do - understand. Oh Miranda. What heart-break. You are so brave and deserve so many "props" (whatever those are) for not shoving it in people's faces when they ask stupid questions like that. I think if more people were open about their struggles with infertility (which is such a hard thing to be open about I'm sure) then maybe others would be more considerate when asking about things like that. I can't imagine how hard that must be for you guys and I hope you are met with nothing but sensitivity on the subject from here on out. On a lighter note, my word verification is dogly- which is how I feel today. A mix of "she's a dog" and ugly. :) I think I may have to make that my new vocab word. Hugs your way, and you absolutely are amazing. If think you are pretty cool to be able to think this through and come up with responses. Love ya. What a wonderful post. It's always hard when people ask things and don't know, but like you said, it's almost always because they care about you. We chose to tell people about our miscarriage for the same reasons - it's just easier to be honest, plus then the person asking doesn't keep "pushing" so much and making things feel worse. At least, generally they don't! You are so brave to be honest about these things; you are on my mind often. I pray you are able to have more children, you seem like such wonderful parents! A very simple answer I use that help people stop being "helpful" is ....I am not able to have any more babies. I love your answers - and I don't agree with Anonymous, I don't think they are humiliating. I think honesty is best - plus it might make them think twice before they ask someone else a question that is none of their business. I agree with Hannah - family planning questions are off limits! Oh, sweetie. I'm sorry you going through this. Reading your blog revived that painfully hollow feeling that accompanies infertility and I am heartbroken for you. And I'm sorry that you feel badgered into revealing something that is intimate and difficult. But I think your answers are tactful and will be helpful. And I think this method of coping, by being more forthcoming, will help you feel better. I've never been very good with communicating, so I never knew what to say when I was asked those questions (especially when they were coming from family members who knew that I was infertile and seriously should have known better). My coping method was to eat an entire bag of fun-sized candybars while sobbing on the bathroom floor - a method that worked really well for me, but not one I would necessarily recommend to others. Oh, Miranda. You are a classy, classy girl. Usually I just want to respond to that question with some sweet-voiced variation of "Well...it's really none of your damn business." But, as you say, it's generally well-meaning people rather than prying shrews. So I swallow the vitriol down and change the subject abruptly. I applaud your list and send you hugs. You are an exemplary lady. Those answers are just perfect -- and I think they need to be said. Most people don't understand how infertility if they don't know someone who has struggled with it. You have the opportunity to help people understand it. 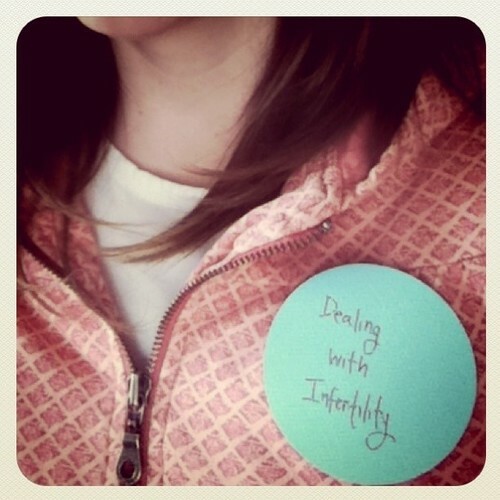 Because there is such pain in infertility, especially in having to explain why to others. One of my dear friends is a mother to an only ... I'm going to send her a link to this post. I feel for you. My husband and I have a 6 1/2 year old, had three miscarriages, went through all the medical tests and have been waiting to adopt for a year and 1/2now. People's comments can sting so badly. We are becoming more and more content (after YEARS of heartache and trial) with our family...AS IS. So, when well-meaning people ask those questions now I just say, "You know, we are happy with our family. Who knows if we will have more? We feel so blessed to have our son, so we're ok." Hang in there. The Lord has a plan for each family- each one is different and beautiful and blessed. Prayers and best wishes for yours. Sorry, I'm just finding your blog. We've been trying to conceive our first for 5 years now. :( I also have PCOS, a blocked tube, AND my hubby has a very low count. We've done everything short of IVF in the fertility world. I also would give very vague answers when people would ask (we've been married 8 years)! The questions finally stopped coming after I expressed to the world via Facebook that we were infertile and moving towards adoption this year! Wow, it's like a weight has been lifted. I also didn't like the fact that they were inquiring about our reproductive organs, but like you said, I'm sure they mean well. I cry a lot, but now with the hope of adoption I feel I have a goal...a purpose. Thanks for sharing your story!